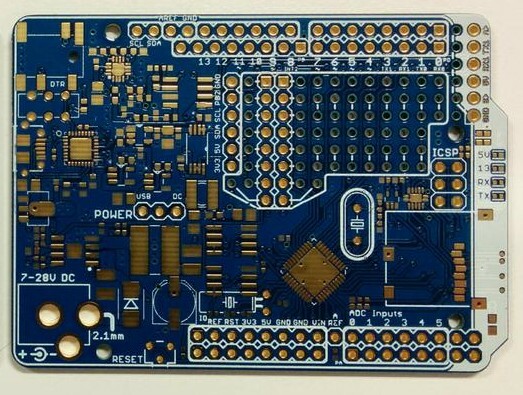 The PCBs for the latest Goldilocks Analogue prototype (3) are now back. I hope that this is the last prototype before a production version can be finalised. OK, so I didn't even build the last PCB. The SPI bus is overloaded by having both DAC and input device (SD card or SPI EEPROM / SRAM). I spent a long time trying to stream audio from the SD card on the SPI bus to a RAM buffer and then back out the same SPI bus to the DAC. Basically, interrupting transfers from the SD card to make regular (every 22us) audio SPI transfers doesn't work. Or, at least I can't make it work. I investigated the USART MSPIM capability (present in every Arduino AVR) as an alternative, and found it works great! AVR USART MSPIM Description. 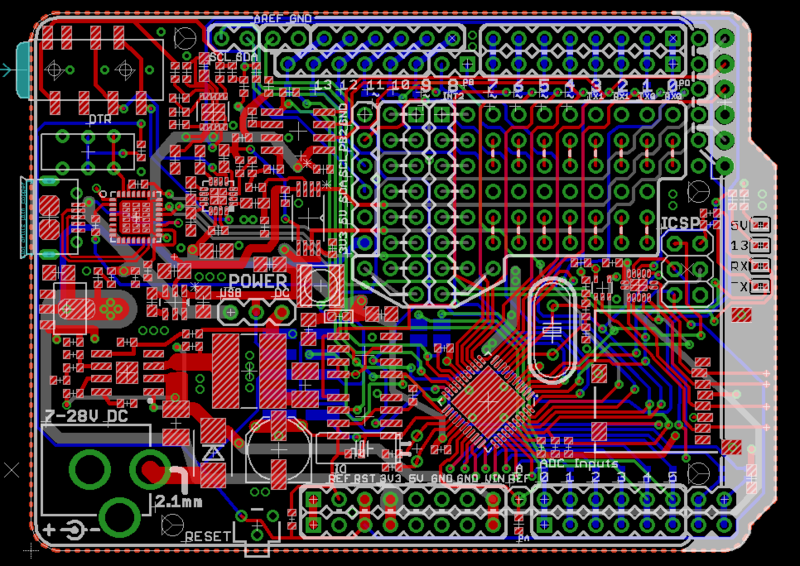 So, I built it into a new PCB which is coloured blue to avoid confusion. Available SPI Memory Options: Pick 2 of 3 (or 2x of one type). The Goldilocks Analogue V3 is working very well. I've built a synthesizer to test both the analogue outputs and the use of the MSPI Mode on the USART. Good news is that it works as hoped! Following up on that success, I've decided to add more features. Firstly, changing the 3.5mm socket to add a microphone connector (TRRS), and also adding a microphone amplifier capability. The microphone amplifier output is connected to the A7 input. I've also build a level shift in case there is a Line-Level input (which would overload the microphone amplifier), which is connected to A6 input. Both of these analogue inputs are outside of the normal Arduino UNO R3 footprint, so they won't affect standard Arduino capabilities. I've also simplified the negative supply for the Op Amp (for the DC capable analogue output). Previously, it was an inverter chip (-5V) followed by two parallel regulator chips. Now, it is supported with a -3V inverter and regulator in one chip. The space saving has been completely used by the addition of the microphone circuitry. 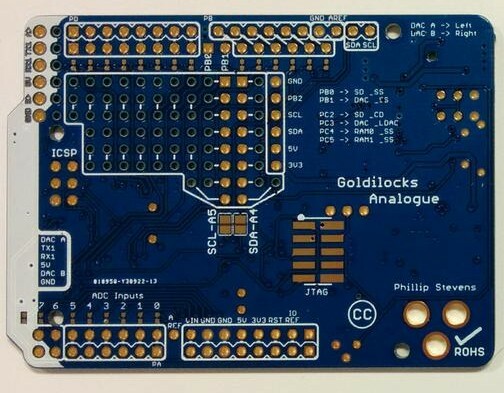 the Goldilocks Analogue has made it to a Kickstarter campaign. Andy and everyone at CCHS for encouragement, and listening. Angus for his SMD skillz, and lots of production tips. Jon at Freetronics for kicking off the whole thing in 2013. Freetronics Forum members, for your encouragement, and feedback here. It has been a very long process, but I think the end result is worth the wait. I hope that you will be able to support me one more time. The Goldilocks Analogue pre-production has been completed, and a wrap-up is here with all of the relevant production files. Looks like you are close to shipping these. Will you have extras? If anyone is interested in capturing one of these Goldilocks Analogue boards, they are now available in two places. For those of you in Australia, I'd recommend Little Bird Electronics. For those not so lucky, I'd recommend Tindie (which means I'll ship them to you personally). The Goldilocks Analogue User Manual is available, and the Production Testing Document has reached Version 2 following inclusion of Windows 10 test procedures. Revised Arduino IDE Variant files for Goldilocks Analogue using the Arduino core are available on Github. Also additional optional libraries to provide support for each of the advanced features of the Goldilocks Analogue are available in the Arduino IDE Library Manager. DAC Library (including IIR Filtering), using Timer 3. SPI SRAM and SPI EEPROM Library (including Ring Buffer solution). C90 Real Time Clock Library, using Timer 2. Arduino FreeRTOS Library, using the Watchdog Timer. 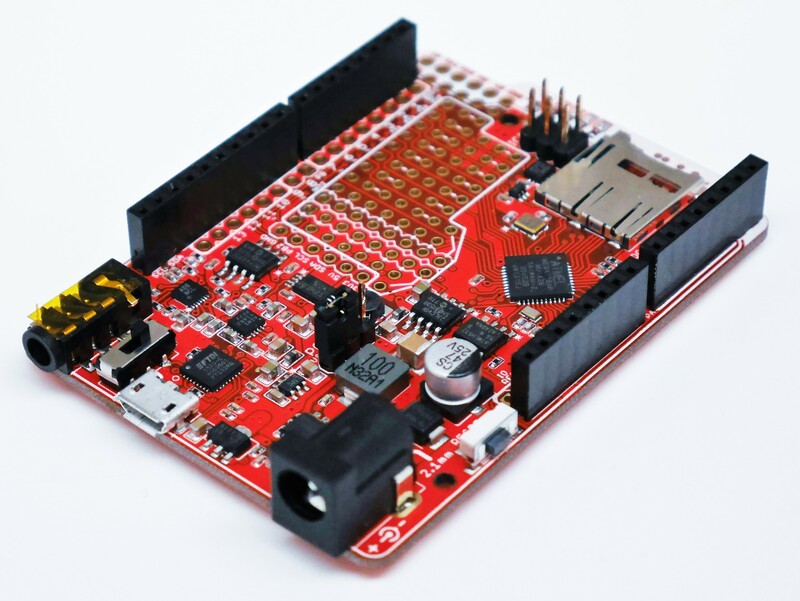 There is also a Google Plus Community for 1284p based boards, including the WiLDFire and Bobuino2, which you can also join.